I read this article and found it very interesting, thought it might be something for you. The article is called Maharashtra’s Opaque Road Projects and is located at https://archive.indiaspend.com/sectors/maharashtras-opaque-road-projects. IndiaSpend’s Prachi Salve filed four rounds of Right to Information (RTI) petitions over the last 75 days and got back only two responses. We had sought information on the amount of toll collected on the Mumbai– Pune Expressway, Pune–Nashik highway, Thane Ghodbunder road and Thane-Bhiwandi road and we received responses only for the last two queries. The answers actually beg more questions and shows up the larger opacity around which such transactions are executed and highlight the need for urgent reform. The state of Maharashtra has a road network of 2.41 lakh km, and the state’s expenditure on roads has increased from Rs 539 crore to Rs 2,368 crore between 2005 and 2011. In 1996, the Government of Maharashtra decided to formulate a private-public-partnership (PPP) policy to finance its Road Development Plan (1981 – 2001) that in turn called for nearly Rs. 26,000 crore of investments. The policy also led to the creation of the Maharashtra State Road Development Corporation (MSRDC) to undertake development of roads and related infrastructure, mostly with private participation. The projects are undertaken by MSRDC under the ‘Build, Operate and Transfer’ (BOT) basis.BOT is a type of project financing wherein the developer is allowed to recover his investments by collecting toll over a concession period, generally 30 years. MSRDC, from its date of inception (9th July, 1996), has completed 18 projects with an estimated cost (final cost and not necessarily cost at the point project was kicked off) of Rs7,187 crore and actual expenditure ofRs6,822 crore. According to the Maharashtra Economic Survey, the total toll income of MSRDC from partially and fully completed projects, up to 30th September, 2011, was Rs 5,680.15 crore. Now, in order to facilitate the PPP projects, the state government amended the Bombay Motor Vehicles Tax Act so that the entrepreneur/contractor could collect toll under the BOT agreement. Toll rates vary for different vehicles and are fixed for 3 years with a clause permitting an increase of 6% per annum after every 3 years. Separate toll rates for projects costing up to Rs 20 crore and between Rs 20 -75 crore have been finalised by the government. Toll rates for projects more than Rs 75 crore are fixed separately. 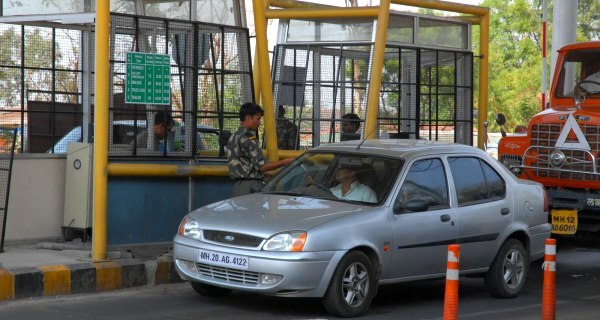 MSRDC is attempting to bring about transparency in its handling of the toll stations, and has published some information about toll incomeon its website. But rather than clearing the air, it has made the picture foggier. For example, the total income of the Thane-Ghodbunder road is Rs.9.36 crore per year, according to the MSRDC website. But according to a reply received over IndiaSpend’s RTI query with MSRDC, the amount collected was Rs 176.17 crore as of 1st July 2012. It’s quite likely the former figure refers to yearly income to MSRDC and the latter, cumulative income to the toll operator. But this is not clear from the responses. Incidentally, the RTI response also says the project was costed at Rs 240.20 crore and the amount to be recovered is Rs 640.85 crore. This would suggest there is no year-by-year breakdown of payouts (at least that IndiaSpend has been able to find) to the Government by IRB. The MSRDC has claimed in its RTI response that the amount collected is retained by the BOT operator because it would carry out improvements to the roads at its own cost. The operator has been authorised to collect toll up to 31, December 2020 after which the Government of Maharashtra will take over operations. But the mystery somewhat deepens when one looks at the website of the toll collector – in this case Ideal Road Builders (IRB). Take the case of the Thane-Bhiwandi project (not to be confused with Thane-Ghodbunder). According to the IRB website, this is worth Rs 104 crore while the RTI response from MSRDC says total project cost is Rs 199.64 crore. In the response received by IndiaSpend on the question of concessions, there are no arrangements in place for the transfer of project in case of the Thane–Bhiwandi toll station. The total project cost is Rs199.64 crore while the total amount covered is Rs315.84 crore. The response also clearly mentions that there is no provision whatsoever to reduce the toll charges if the project cost is met, and the contract remains with the contractor (IRB) until 13.05.2017. Surprisingly, the total amount is not shared with either the central or the state government or there is no indication of that here. The need for private partnerships in developing infrastructure perhaps cannot be countered. But there is surely a need to vastly improve the availability of good quality information particularly when it involves payment of infrastructure goods. The first step could be to make available accurate and easily comprehensible information on how much toll has been collected and how the funds are flowing out and back.